The U.S. Department of Agriculture’s Natural Resources Conservation Service (NRCS) is looking for ways to upgrade the Phosphorus Index, a simple management tool developed during the 1990s to gauge the risk of phosphorus losses from agricultural fields. In developing a national nutrient-management policy, NRCS allowed states to modify the original index—a matrix of source and transport factors that contribute to phosphorus loss—with inputs to account for local variations in soils, climate, management, and water quality goals. But this resulted in widely different state-by-state phosphorus indices that often didn’t agree with each other on how to manage phosphorus. “We’d put in the same numbers and get different results, depending on the state,” says Agricultural Research Service soil scientist Peter Vadas, who works at the U.S. Dairy Forage Research Center in Madison, Wisconsin. Additionally, many of these indices were not tested against monitoring data to show that they gave reliable results, or they didn’t quantify phosphorus loss—such as losses in pounds per acre—which made them difficult to test against field data. So Vadas worked with colleagues to develop the Annual Phosphorus Loss Estimator (APLE), a user-friendly spreadsheet program that predicts field-scale phosphorus loss in runoff for a whole year. 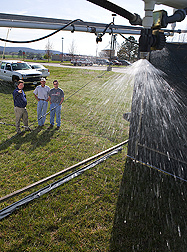 His ARS partners included hydrologist Carl Bolster, in Bowling Green, Kentucky; soil scientist Philip Moore, in Fayetteville, Arkansas; and agricultural engineer Michael White, in Temple, Texas. University of Wisconsin researcher Laura Good and Purdue University researcher Brad Joern also partnered on the project. 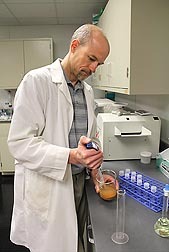 Hydrologist Carl Bolster prepares a soil sample to determine soil phosphorus concentration, an important input parameter to the APLE model. The scientists developed APLE so it would be as easy to use as earlier phosphorus indices. It could be used in many different states to quantify field-scale phosphorus loss and soil phosphorus changes over 10 years for a given set of runoff, erosion, and management conditions. They included information and data that has been established for decades, as well as important innovations, especially for phosphorus loss from manures and fertilizers. The scientists started out by programming APLE with data from 21 field studies that measured the impact of surface-applied manure and fertilizer on phosphorus loss (see What's In a Model?). The 21 studies represented a wide variety of field sizes, crop and manure management conditions, manure types, and geographic locations across the United States. Then the scientists expanded APLE to include dissolved phosphorus loss from soil and sediment phosphorus loss from erosion. They tested APLE with field data from another 28 studies that monitored phosphorus loss in runoff from fields for at least a year. The team showed that APLE could reliably quantify phosphorus losses in runoff for many different situations and could produce more reliable estimates than some existing phosphorus indices. From there, Vadas and his colleagues again expanded APLE to simulate changes in soil phosphorus over 10 years. This application would be important for farmers concerned about accumulating too much soil phosphorus or wondering how long it might take to reduce the phosphorus that had already accumulated. The team compared APLE soil phosphorus simulations with field results from 25 studies that monitored changes in soil phosphorus from 1 to 29 years. Many of the agronomic conditions in the studies varied considerably. Simulation scenarios included predictions for total soil phosphorus for a variety of soil layer depths; increase in soil phosphorus over time resulting from consistent phosphorus amendments; decrease in soil phosphorus over time in the absence of soil phosphorus amendments; and phosphorus stratification levels when phosphorus was applied but not tilled into the soil. APLE estimates were consistently in line with field measurements. Results from these studies have been published in Transactions of the ASABE, Journal of Environmental Quality, and elsewhere. Some of the equations used in APLE have also been incorporated into the phosphorus indices used in Wisconsin and Arkansas. Most recently, the scientists have been using APLE to improve the assessment of phosphorus losses from agricultural fields and whole farms. For instance, Bolster led a project demonstrating that APLE can be used to rapidly and easily develop weighting factors for determining the relative contribution of phosphorus losses from different sources, such as soil, manure, or erosion. Weighting factors for most indices have already been developed with input from field experts, but Bolster’s results showed that APLE-generated factors significantly improved the correlation between index outputs and a large and diverse set of published field data. In collaboration with scientists from the University of Wisconsin in Madison and Platteville, Vadas has been adapting APLE to simulate phosphorus loss from pastures grazed by beef and dairy cattle and from barnyards and exercise lots on cattle farms. With these improvements, APLE can be used to develop whole-farm estimates of phosphorus losses and the most effective strategies for reducing phosphorus losses from cattle farms. These practices could include barnyard improvements for capturing discharge, soil conservation practices that reduce erosion, or manure application practices that reduce exposure to runoff water. APLE is free to download at tinyurl.com/phosphorusloss and includes supporting technical documentation and a user’s manual.—By Ann Perry, Agricultural Research Service Information Staff. This research is part of Agricultural and Industrial Byproducts (#214), Climate Change, Soils, and Emissions (#212), and Water Availability and Watershed Management (#211), three ARS national programs described at www.nps.ars.usda.gov. Peter Vadas is at the U.S. Dairy Forage Research Center, 1925 Linden Dr. West, Madison, WI 53706; (608) 890-0069. "A Modeling Milestone for Soil Phosphorus Management" was published in the April 2013 issue of Agricultural Research magazine.